How much has U.S. currency inflated since 1792? How much has U.S. currency inflated since the Coinage Act of 1792 established the U.S. Mint? 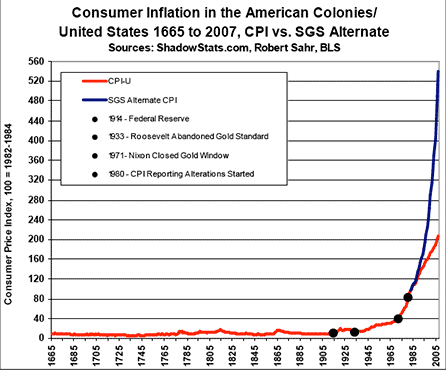 Adjusting for inflation, what amount of modern currency would have the same buying power as a 1792 dollar? Likewise, what hypothetical denomination in 1792 would have the same buying power as a modern penny? (Presumably it would be much less than a half penny, which I understand was the smallest coin at the time). Please don't use CPI. CPI only measures consumption bundles for wage workers. If you want to measure inflation you need to ask why you're equating the value of money over time. www.measuringworth.com goes into this, in great detail, with multiple theoretical papers and multiple measuring systems for US inflation. To buy what? Playstations. No amount of 1792 money could buy playstations. To determine the labour cost of a project? Production worker compensation. See measuring worth, they go through this problem in depth. From what I've read on the theoretical problem, and the concrete problem in extended period wage bargaining, the problem is intractable in capitalism as all money is contingent upon the market for money, and as the price of labour is fungible. The CPI bundle has to change over time, we drink less beer now than in the past, and buy more playstations. The purpose of CPI inflations is to indicate the long term cost of labour to capitalists. The unskilled wage talks more about share of total social output, as does the Production Worker Compensation. One is the "minimum price of labour," the other the "average socially necessary" form of labour. Nominal GDP per capita takes into account the growth in the number of people and the growth of the total economy. GDP is the size of the total economy. If you want to talk about building a Navy (for instance, how much were the Frigates worth compared to an Aircraft carrier), use GDP. If you want to know if a nation spanning industry was bigger then or now, use GDP/capita. Measuring worth explains these in detail. CPI is occasionally a valid measure for certain things. The cost of beer should be computed in CPI terms. But it is a poor measure for many many other things. For instance, the salary of Doctors shouldn't be computed in CPI terms, as Doctors aren't CPI wage labourers. Taking the link SevenSidedDie found, it looks like a penny in 2007 would have been worth roughly 0.037 cents at the founding of the Republic. The interesting thing is that if you look at the graph, almost all of this inflation happened after the 1930's. For most of the history of the USA, the buying power of our currency was fairly stable. What changed in the '30's, you might ask? Well, that's when we untethered the dollar from any precious metal's value and let it float on its own. If we grant that the dollar changed insignificantly until the 1934 when the dollar was detached from the gold standard, then we are left with some way of attaching value to something else that is constant. Because all companies and their products are expressed in dollars, it would be a circular reference to attempt to use those. I see only one constant: the value of a common, unskilled laborer. Workers that require little or no training have been in demand since the beginning of time, and still exist today. Granted working at McDonald's today would be quite different than working in the woods hauling bins in the 1890s, but you could probably take either one and swap their positions and soon be at about the same rate of production on both sites. We don't have the best metrics of this, but we do know that the 1938 minimum wage laws were set at 25 cents an hour. So an hour of an American worker's time was worth at least 25 cents. Today an hour of an American worker's time is worth $7.25. Simple math would lead us to indicate that a cent today is worth $7.25 / .25 = 29 cents. The inverse of this would indicate 0.034 cents of those dollars for a cent of today. This appears to also be in line with T.E.D. 's estimate of 0.037 despite using an entirely alternative system of calculation. Not the answer you're looking for? Browse other questions tagged united-states economy contemporary-history currency or ask your own question. First evidence for replacement of barter trade by local abstract currency? How did shells, bones, and other trinkets work as currency? Did the American Founders Debate on the Relative Size of the Government? Why was a gold standard not stipulated in the U.S. Constitution? How would British counterfeiting efforts in the revolutionary war have inflated the American currency?